Eurocom, a leader in upgradeable notebook technology since 1989, now offers high-end notebook computers with up to 1GB of upgradeable DDR3 video memory. The new upgradeable VGA technology is available in NVIDIA GeForce Go 7900GTX and NVIDIA Quadro FX 2500M (supporting OpenGL) graphics processing units (GPUs) with 512MB on-board in a single mode or 1GB (2 x 512MB) in a dual-mode SLI operation. The high-end EUROCOM notebooks with 512 MB new VGA modules offer users improved performance for video, graphics, gaming and any 3D or simulation applications. Mobile Workstation is a new category of notebooks designed with a professional user in mind. CAD/CAM designers, engineers, architects, animators and graphics designers who must frequently travel, yet need access to powerful computing, are the core target for Mobile Workstations. With unrivaled power, unsurpassed features and unmatched style, the Mobile Workstation is the ultimate evolution of the Desktop Replacement notebook. With the release of mobile workstations, EUROCOM has taken the next step in the evolution of the desktop replacement by combining workstation like features, power and flexibility with desktop replacement technology. Mobile Workstation is the most powerful notebook on the market. 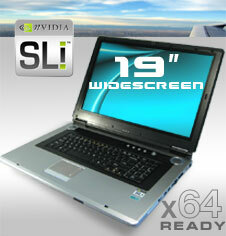 It is engineered for the highest quality, best performance, long-term stability and latest computing technology. Mobile workstation features the most innovative computer technologies available on the market such as the fastest processors, most advanced graphics, multiple optical drives and Hard Drives offering RAID 0/1, large displays and full size 102-key keyboards. The 512 MB video modules are now available in the following EUROCOM Mobile Workstations: M590K Emperor, D900K F-Bomb, D900T Phantom and M570U Divine. The EUROCOM M590K Emperor is the most luxurious, powerful and fully featured 64-bit EUROCOM Supernotebook ever built. It features the largest, most spectacular 19-inch Widescreen WSXGA+ 1680-by-1050 pixels resolution display with a 16:9 aspect ratio ever to grace a portable computer. The M590K model is World's First notebook powered by nVidia nForce4 chipset and by the fastest 64-bit ML-44 2.4 GHz AMD Turion 64 Mobile processor. It offers users the Nvidia's revolutionary SLI (Scalable Link Interface) Video Technology with two 256MB Nvidia GeForce Go7800GTX or two 512MB video with NVIDIA GeForce Go 7900GTX SLI. It supports also 512MB of NVIDIA Quadro FX 2500M with OpenGL. The best high-end gaming and professional fully upgradeable Supernotebook is wonderfully suited for those doing 3D animation, 3D simulation, publishing and graphics work. The 290-nits brightness ensures that even in direct sunlight you can see the display clearly. The EUROCOM M570U Divine is built upon the new Intel Core Duo, which is actually two processors (up to 2.33 GHz) engineered onto a single chip. It provides 2MB of L2 Smart Cache that can be shared between both cores as needed. It delivers higher performance in 2D and 3D graphics, video editing, and music encoding. EUROCOM M570U Divine has a front side bus and memory at 667 MHz, 16x PCI Express, up to two Serial ATA hard drives and upgradeable 512 MB VGA graphics with NVIDIA GeForce Go 7900GTX or NVIDIA Quadro FX2500M (supporting OpenGL) for superfast graphics performance. Designed for high-performance professional computing, gaming, movies, digital photography, and video editing, it delivers an ultra-smooth game play and digital media experience. EUROCOM D900K F-Bomb is based on 64-bit Dual-Core AMD Athlon64 X2 processor for blistering application performance. From artwork design to video editing and gaming, the dual core processor ensures that the system stays responsive when taking care of the most complex multiple tasks. The 64-bit processing delivers true multi-tasking, allowing users to switch from one program to another without waiting for the computer to catch up. The D900K features fully upgradeable video technology with 256MB or 512 MB GDDR3 and 16-pixels pipelines to ensure that even the latest applications and games perform at their best. It supports the most powerful mobile graphics accelerators available from ATi and NVIDIA including 256 MB GDDR3 Nvidia GeForce Go 7800GTX, ATi Mobility Radeon x800 XT Platinum Edition, NVIDIA 6800 Ultra or NVIDIA Quadro FX1400 and 512 MB NVIDIA GeForce Go 7900GTX and NVIDIA Quadro FX 2500M (supporting OpenGL). A unique UltraBright Glossy screen technology comes as standard giving a wider viewing angle and improved colour brilliance. The F-Bomb with Windows XP Professional x64 Edition offers is a fully 64-bit capable notebook to work with new 64-bit applications and games. The EUROCOM D900T PHANTOM featuring Intel� Pentium� 4 processor with 1MB of cache (LGA775) and high-bandwidth PCI EXPRESS architecture alleviates the limitations and bottlenecks of the traditional notebook or PC - opening up a wealth of possibilities for 2D and 3D designers, video and audio producers, scientists, engineers, researchers, game developers and players. The industry most innovative technologies such as powerful graphics with 512 MB NVIDIA GeForce Go 7900GTX and 512 MB NVIDIA Quadro FX2500M (supporting OpenGL), high-speed, high-capacity memory and plenty of storage options (two physical Hard Drives, two optical drives and 7-in-1 media card reader) make the EUROCOM PHANTOM one of the fastest PCs ever built. EUROCOM high-end notebooks, powered by Intel and AMD processors, are built on a customized basis so that clients can select the individual configurations they require. EUROCOM systems offer stylish all-in-one design, superb performance, upgradeability and latest computing technology. EUROCOM mobile workstations are fully upgradeable including Hard Drive (Hard Drives), memory, optical drives, processors and graphics, and can be configured to a user's choice of specifications.